The Last Remnant of The Ingleside Racetrack? The outside lands have some unique houses. Some are made from 19th century streetcars formed in clusters of sand dunes and known as "Carville". Others are earthquake refugee shacks from 1906 hauled away from camps and set on lots. However, I've been interested in a certain type of home, attached to a great "outside lands" landmark long gone: the jockey houses from the old Ingleside Race track. The Ingleside Race track opened in 1895 just south of Ocean avenue, built on land carved out of the old San Miguel Rancho. The Pacific Coast Jockey club opened the track, but had little success and closed the doors in 1906, leaving behind stables, offices, and jockey houses. Camp Ingleside, 1906. The Ingleside Racetrack was used as refugee housing after the earthquake. - Courtesy of the San Francisco History Center, San Francisco Public Library. When the tragedy of the 1906 Earthquake and Fire left thousands of San Franciscans homeless, the race track and its stables provided space for a refugee camp and hospital. The book The Earth Shook, the Sky Burned recounts how the stables were converted into temporary hospitals and used until 1908, when the refugees moved out (and the Urban Realty Improvement Company moved in). 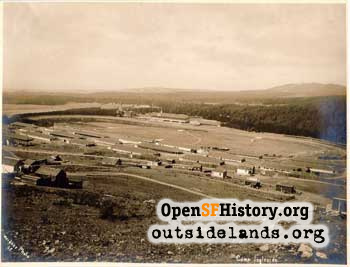 The official name was "Camp Ingleside", a large expanse of small jockey houses and stables used as houses. Sections of stables were divided; some for sleeping, some for reading, some for dining. Most of these were demolished when construction on Ingleside Terraces began. I recently talked to a resident of the area, who had no idea that her neighborhood was an old racetrack. She says that she often goes to the Sun Dial, but never knew its history. Most people are unaware that the oval Urbano Avenue is laid out tracing the old racetrack. I had heard speculation that the house at 280 Byxbee is a jockey house from the old track and paid a visit to its current owner. According to research done by Jim Wessel, owner and resident of 280 Byxbee, the front part of the house is indeed a jockey house. The back part was added on in later times. While cleaning and repairing his roof, he found newspapers dating back to 1921, apparently used for insulation. The front door of the house is only 5 feet 9 inches tall! The roof was the same height but raised later for obvious reasons. An interesting story passed down is that the owner of the track came into the house and bumped his head on the ceiling. He was out cold. A jockey's wife got a glass of water and threw it on him. Upon returning to consciousness, his first words were "I'd like my next drink in a glass." 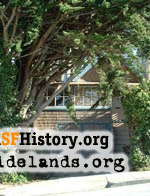 Jim also noted that the tall house on Garfield and Monticello was part of a sheep farm. (However, the next door neighbor of this house says it was moved there. From where it was moved is unknown.) The house on 239 Byxbee might also be a Jockey house. I did not get a chance to talk to the owner. If you suspect your house might be a jockey house, tell me. Sean M. Hall is WNP's youngest member (at 13 years of age) and proves that interest in the past isn't limited to old folks. He's started his own San Francisco History Site at www.sfhe.tk. Thanks Sean!